The specimen is form the recent find in 2006. The crystals, grouped as fans, are very well defined, have an excellent color and are very bright. 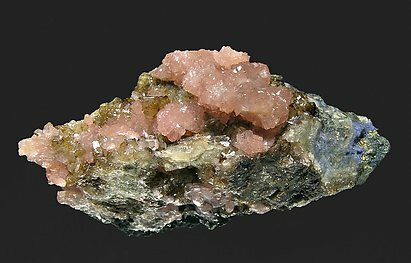 They are with very deep pink crystals of Huréaulite. As we usually do with species, or we rare samples, we will send a copy of the analysis to the buyer. The sample is from a recent find of this rare manganese phosphate. Its crystals are very well defined, have an excellent color and luster and are very big for the species. They are with pink crystals of Huréaulite. This is a magnificent opportunity to obtain the two species but we especially note the Correianevesite, really of an exceptional quality. We will deliver to the buyer a copy of the analysis. 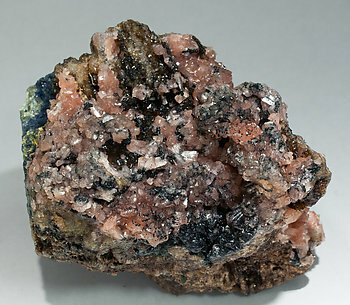 Very well defined Correianevesite crystals on matrix with a considerable size and quality in some areas on the sample, with a dark brown color, and with groups of pink Huréaulite crystals and dark green, almost black, botryoidal growths of Rockbridgeite. 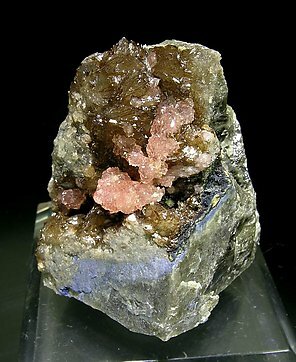 A recent study of the crystals from the Cigana Mine that in 2006 were identified as Reddingite has shown the discovery of this new and rare species. So, the old Reddingite from Cigana must be renamed as Correianevesite, being Cigana Mine, at Galiléia, the type locality. We’ll send a copy of the analysis of the original “Reddingite” to the buyer. Excellent specimen of this uncommon manganese phosphate. Correianevesite crystals are well defined, with good color, brilliance and size for the species. The matrix consisists of delicate rosettes of prismatic Huréaulite crystals, very sharp and with good brilliance, with pinkish tones. 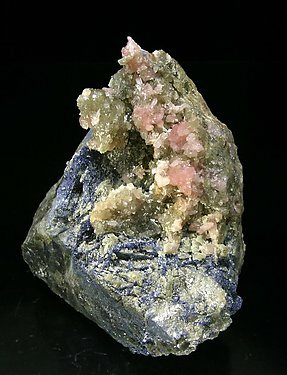 On the base there is a growth of crystalline and deep blue Strengite with small Triphylite crystals. As we usually do with rare species, we will send a copy of the analysis of the Correianevesite and Triphylite to the buyer.